When looking to cut body fat and stay toned, you can live on a very low sugar and mainly fibrous carbohydrate diet, creating the perfect environment combined with regular training to look toned as well as slim as you’ll be building slight mass but making it firm and cutting the covering body fat. Couple this with a high protein diet (chicken, eggs, turkey, fish – oily fish are great as are full of good fats) and as much dietary fibre (low sugar, green vegetables) as you can eat – you will build muscle mass (not lots as females don’t have enough testosterone to do this, but you will gain a lot in strength which is great!) 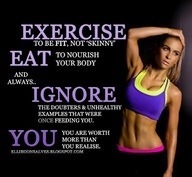 and strip down your body fat levels. This new higher level of muscle mass will in turn increases your bodies metabolism, enabling it to cut body fat and feel fresh and healthy!